The doors at B’Sghetti’s may be shuttered today, but the owner and his partners have already cooked up an idea for a replacement. The new concept is called Sassafras, and it sounds like it will be committed to fresh food, local vendors, and a changing menu. Glad to hear that the space isn’t going to just sit empty! 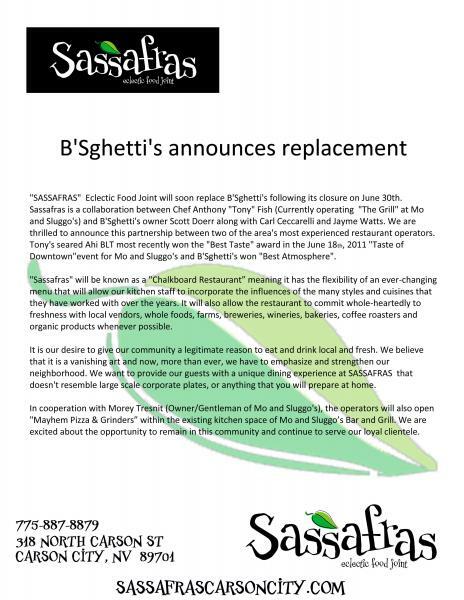 We’ll have to wait until it opens for more details, and to find out if it is plagued by the same price problem that B’Sghetti’s ran into the last few years. It should be exciting, though, and hopefully be another new thing that draws people downtown.